AGS Noise Control provides acoustic solutions which address both the design requirements and the specific constraints of a project. To ensure we retain a direct level of control on the installation of our products, we directly employ our acoustic installation teams, all of whom have many years’ experience installing complex equipment in difficult situations. We are members of the Safe Contractor Scheme which helps to ensure that our designers and install teams complete projects in a safe and professional manner, for themselves and for operators, other contractors and members of the public. 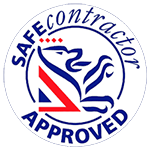 You can view our Safe Contractor certificate here. Read case studies about our installations here. Do you have a project that needs an acoustic solution? Give us a call on 01664 568728 or email us to discuss your requirements.